Will print papers survive in an online world? The nation's $59 billion newspaper industry is facing an uncertain future even while its biggest companies are enjoying enviable profits averaging around 20 percent. Newspaper circulation has been declining for many years, especially among young adults. Now, newspapers are losing readers and some advertising to the Internet. In fact, only 52 percent of adults read the paper on a typical weekday. 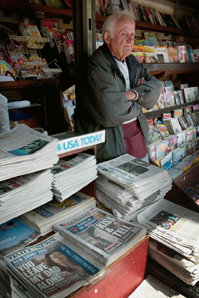 Many newspapers are working on redesigns aimed at making their print editions more readable. Most also have created Web sites to deliver news and information, including special features and interactive options not included in the print product. But newspaper executives are struggling to incorporate their online editions into viable business plans. Meanwhile, slipping profit margins are resulting in layoffs at several of the major newspaper companies and opening up the country's second-largest — Knight Ridder — to a possible takeover.